On 22 Feb, President Trump made remarks regarding the 14 Feb mass shooting at Marjory Stoneman Douglas High School in Parkland, Florida. That is an absurd remark. Active Shooter, or Hostile Events, preparedness is an important and responsible challenge educators, students, and all individuals, should participate in. Proper preparedness doesn’t scare people, it prepares people. Safety and security, like freedom and democratic society, require active participation by all citizens, not just police and government officials. The tragedy that occurred in Parkland is in some ways very simple and other ways, quite complex. The ongoing investigation will address some of that, though a lot will be missed in the noise that is modern American politics and media. A far less consequential tragedy is that events like this get rapidly politicized, very important lessons learned can be missed, and some wildly incorrect things can be said. Among those wildly incorrect things, on 22 Feb, President Trump stated that, “active shooter drills is a very negative thing, I’ll be honest with you. I mean, if I’m a child and I’m 10 years old, and they say, we’re going to have an active shooter drill, I say, ‘What’s that?’ ‘Well, people may come in and shoot you.’ I think that’s a very negative thing to be talking about, to be honest with you.” Oh boy, Mr. President. Please, stop. Let’s look at that horribly short-sighted comment and two other aspects of preparedness that should be appreciated in light of the terrible attack in Florida. 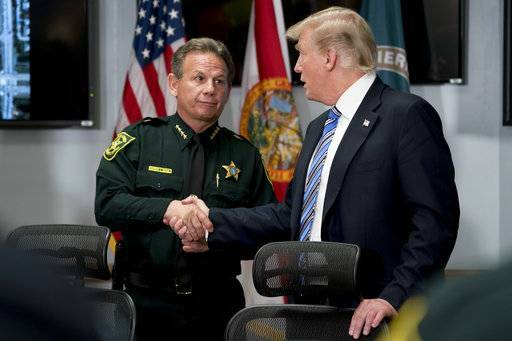 Also on 22 Feb, Broward County, Florida, Sheriff, Scott Israel reported that an armed officer was assigned as the school resource officer for the Marjory Stoneman Douglas High School, where the recent active shooter attack took place, resulting in the death of 17 individuals. Deputy Scot Peterson, who has resigned after being suspended, was on-site, armed and in uniform, when the shooting took place. For as yet unconfirmed reasons, the officer failed to respond – he did not intervene during the attack. Sheriff Israel stated that there is video footage (which has not been released due to the active investigation) showing Peterson “arriving at the building where the shooting broke out about 90 seconds after the first shots were fired, and that he remained outside for about four minutes… Asked what Mr. Peterson should have done, Sheriff Israel said: ‘Went in, addressed the killer, killed the killer…’ Sheriff Israel said Mr. Peterson had not given a reason for why he did not go into the building where the shooter was. It is unclear if he will face charges” (BBC). That failure demonstrates the importance of having plans and procedures in place, personnel understanding their responsibilities and expected actions, and the need to conduct routine training and validation through exercises – to include those pesky drills the President doesn’t like – to ensure that when an incident occurs, individuals and organizations are ready to respond effectively. Whether a fire drill, responding to a bomb threat, dealing with an active shooter, or any number of physical and cyber incidents, leaders need to ensure their organizations, and the people they are responsible for, are prepared to deal with the most concerning situations they may encounter. On 22 Feb, President Trump met with state and local officials, as well as members of his Cabinet, and made remarks about how to make schools safer. The President advocated for background checks, mental health facilities, arming teachers, and other ideas. He also stated that he doesn’t believe In conducting active shooter drills at schools. Out of respect, and for proper context, those remarks are included below. Commissioner Stewart raises some very good points. The President… er, in that comment, not so much. Let’s start with an area that often comes up after incidents and in exercises – communications. It also comes up in families, so let’s start with some parenting tips. That’s free, no credit needed; feel free to use that, Mr. President. Whether the police officer at the school, the individual receiving a suspicious activity report, or an individual caught in a bad situation, we need to know what to do, where to go – how to respond. We need to have a plan, it should be practiced, and it should be validated in exercises. It’s for that reason that the government – the FBI, DHS, state, and local – has spent so much time studying active shooter attacks and developing materials and training programs to prepare organizations. Its why universities are developing videos and references for their students and faculty, its why our team and our partners have developed the Hostile Events Preparedness Program. At the individual or family level, maybe you don’t know where to start. My colleague, James DeMeo, has made it easy for you. 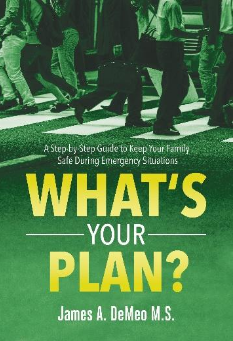 He’s written a simple book titled, “What’s Your Plan?” with background, context, and discussion points for you to consider when going out, at school, and at work. A recent YouGov poll found that only one in ten Americans has taken any kind of active shooter training. Given the debate about guns in schools, gun control, hardening buildings, terrorism, and extremism, you’d think more than 10% of the population would take a few hours and get familiar with simple approaches to becoming more prepared. And that needs to happen – at our places of work, at our schools. We can’t – as free citizens, we don’t want – our public places to seem like military garrisons or nuclear plants. Reasonable hardening is fine – the professional sports leagues are finding great ways to do that while keep events fun and safe. But there is a very important role for a proper level of preparedness. This isn’t about fear – no one wants to scare little Barron, and always question anyone selling any kind of security based on selling fear – this is about personal responsibility. Attacks can come by gun. Or an explosive, or a knife, or a bat… the point is know what to do. These things happen, be prepared. But don’t be scared. In reality, you are far more likely to be injured due to something stupid, like texting while driving, than by a hostile event. Nearly 330,000 injuries occur each year from accidents caused by texting while driving. In 2014 and 2015, the FBI has 40 Active Shooter incidents recorded, with 231 total casualties. The statistics above aren’t meant to minimize the threat of active shooter incidents or other acts of violence. Attacks are very serious, with severe consequences and life-ending and life-impacting effects on those that area attacked, their families, friends and communities. But, threats need to be understood in context, realistically, and properly addressed. In a free society, where people can come and go easily, unencumbered by burdensome and invasive security, and are able to maintain privacy, there will always be dangers, and bad people doing bad things. But, safety and security are both a personnel and collective responsibility, just like being a citizen in our republic, and when we take them seriously, we can enjoy ourselves and get back to that individual pursuit of happiness.